We learnt that Emma, a native of Ohunmere, said he is a Ghana returnee and was a bus driver in Ghana. He confessed that he delved into robbery so as to earn a daily living. On why he did not go back to the driving profession, he said that it was the devil that made him not to venture into any meaningful business except crime. He appealed that he should be pardoned as he will not steal again. He further confessed that one, Chuks Okpehoro, was his accomplice in the operation were about four handsets and other items were forcefully collected from their victims. On his part, Chuks Okpehoro,23, also an indigene of Ohunmere and a school dropout, said that Emmanuel invited him to be part of the operation which according to him they carried out along Sunny Ojougboh area. He confessed that he has been into crime, but he will turn a new leaf if he is freed. Meanwhile, the Chairman, Agbor Gha Ihun, Comrade Fidelis Omoile and his Deputy, Comrade Monday Kiyem, also known as Maduma, have in separate interviews appreciated members of the public for their support, appealing that they should continue to partner with them particularly in the area of information about criminal hideouts. 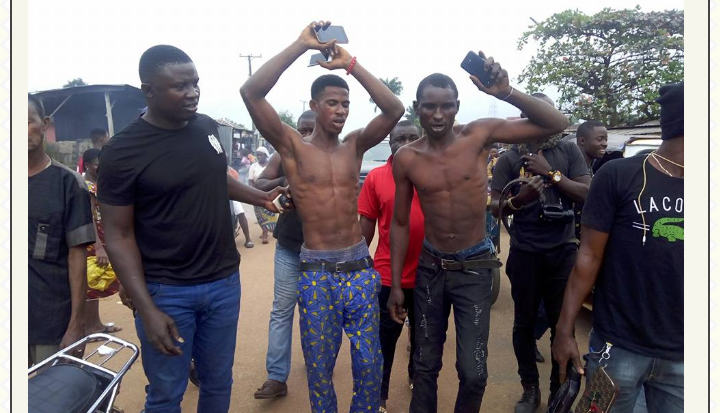 Mr. Kiyem told newsmen that Emmanuel was apprehended in a church in Ime-Obi while playing a keyboard, disclosing that the suspect and a member of his gang carried out the operation at Sunny Ojougboh around 8 pm on Saturday and without remorse, he(Emma) went for night vigil service same night. He called on youths resident in Ika South to stay away from crime and violence.